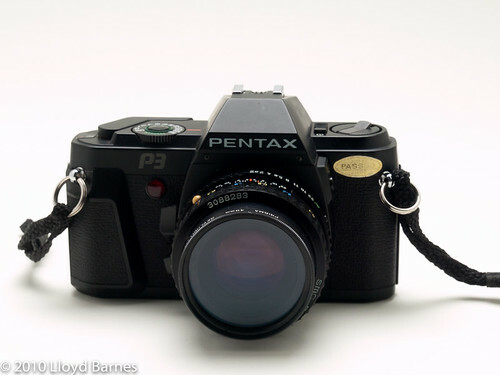 This is the Pentax P3 35mm manual focus SLR, shown here with 50 mm f/2.0 lens. 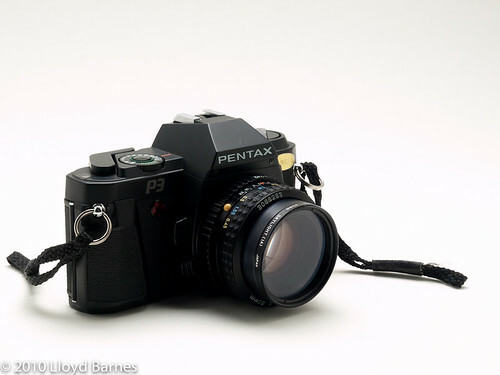 The camera was introduced in 1985 and was marketed towards beginner SLR photographers. It can use Pentax-A lenses allowing full auto exposure mode, but can also be used in manual mode with Pentax-A or Pentax K-mount lenses. It does not have a built-in flash, but has a hot-shoe for attaching an external flash. If a Pentax flash is used it can automatically set the exposure as well. The camera has a built-in LED light meter, making it easy to set the exposure by manually changing the aperture and shutter speed. The maximum shutter speed is 1/1000 s and it has a 1/100 sync speed for external flash. Other features include a self-timer (up to 12 s) and a depth-of-field preview. It has a light weight plastic body, which is quite durable, making it a popular camera for traveling. One of the best things about this camera is it is available for a low price - around $50, often including a 50 mm lens. Since it uses the Pentax K-mount lens system, there is a huge variety of lenses available for this camera! Overall this camera is great for beginners or for photographers who want a basic light weight 35 mm SLR. It has some limitations. One is that it uses the DX coding on the film canister to detect and set the ISO automatically (ISO 25 to 1600), and it is not possible to override it. This is a drawback for more advanced photographers who may want to set the ISO manually. Another limitation is the slowest shutter speed is 1 s, although bulb/cable release is available for long exposures.